[Guangzhou Dehong] Pastel porcelain is a sacred color, and the Qing Dynasty has another creation of colored porcelain, which was founded in the Qing Emperor Kangxi, and developed rapidly during the Yongzheng and Qianlong periods. Pastel is made of glass white on the color painting surface. It is rendered by traditional boneless painting. It highlights the three-dimensional sense of yin and yang, rich in color, and is famous for its beautiful and beautiful scenery. It is highly recognized by people. Collection value. 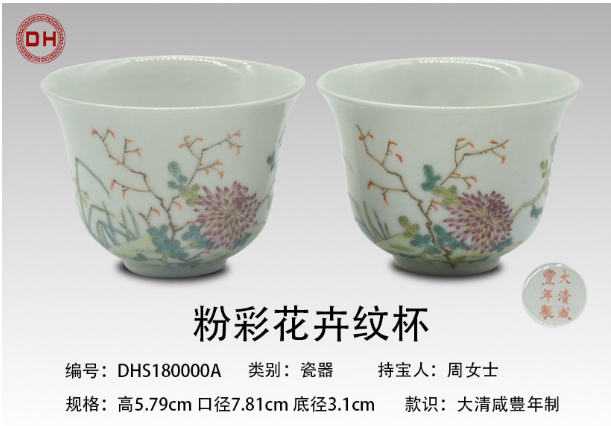 Ms. Zhou’s pair of pastel flower-patterned cups have a caliber of 7.81cm, a bottom diameter of 3.1cm, a height of 5.79cm, a round mouth, a deep abdomen, and a foot-foot. The bottom has a six-character red color of “Da Qing Xian Xian Nian”. The body is decorated with white glaze and decorated with pastels. The inner wall of the bowl has no grain decoration, the light is neat and the outer wall is decorated with floral patterns. Finely watched, the small grass on the outer wall is reliant, the branches are vigorous, the green leaves are swaying, the flowers are full, the fragrance is overflowing, attracting the bees to fly, the gestures are stunned, and the look is realistic, forming a beautiful and harmonious, full of vitality. The overall decorative lines are smooth, the thickness is even and smooth, the meticulous workmanship is exquisite, and the depth is clear. It can be seen that the skill of the craftsman is very high, and it has a very high artistic appreciation. The investment collection value is quite good. This pair of pastel flower pattern cups is elegant in shape, small and exquisite, porcelain is firm and delicate, glaze is smooth and jade-like, the brush is exquisite and gorgeous, the brushwork is skillful, the lines are meticulous, and the patterns are painted in purple, red, yellow and green on the white ground. Ten different, the painted patterns are bright and colorful, and the leaves are twisted and stretched, which is quite feminine. The overall craftsmanship is exquisite, the enamel is radiant, the carcass is dense, the ornamentation is rich and fine, the lines are smooth and smooth, the colors are fresh and elegant, and the calm and elegant charm is revealed, which fully reflects the superb level of the porcelain making process at that time, with a distinct The characteristics of the times are really the best of the collection. In the late Qing Emperor Kangxi, the pastel porcelain was burned in the Kangxi multicolored porcelain and was invented by the enamel production process. It is one of the four famous porcelains in Jingdezhen. The history of the year has the reputation of “there is no ancient people, no one to come after; fresh and dazzling, and the work is always very special”. Because of the rich color and exquisite workmanship of pastel porcelain, it quickly gained the favor of the aristocrats of the Qing Dynasty, gradually replacing the status of colorful porcelain and becoming the main porcelain produced in Jingdezhen. Pastel porcelain has a rich form of expression. Its exquisite workmanship, rich colors, elegant and soft, full of poetry and painting, rich in artistic sense and ornamental value, is known as “the treasure of oriental art” and has a pivotal position in the history of Chinese ceramics. In the porcelain collection plate, pastel porcelain has always been a hot treasure in the art market, and tens of millions of days of price are often concentrated on pastel porcelain. Its position in the collection market is rock-solid, and it enjoys the reputation of “a pink top three blue and white flower”, which is beyond the reach of ordinary porcelain. Nowadays, there are not many powdered porcelains circulating in the market, and the quality is hard to find. The price is very high, and there is a huge potential for value preservation and appreciation. Nowadays, it is a good time to start collecting. 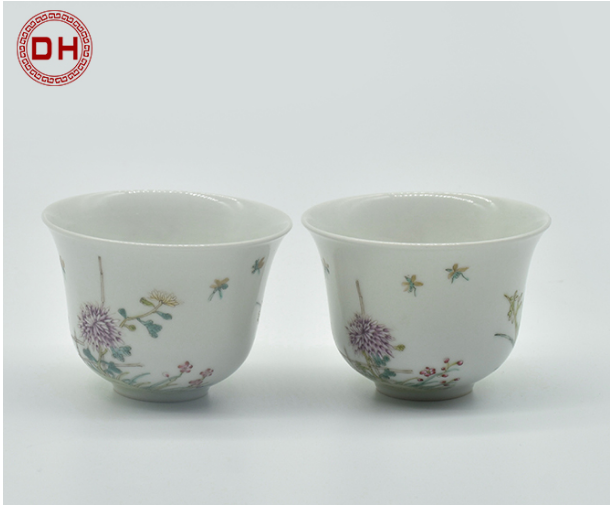 Ms. Zhou’s pair of pastel floral pattern cups are preserved intact, the appearance is as new, the style is elegant and elegant, the charm is luxurious, the collection is beautiful, the shape is skillful, and the technique is fine. It is a rare pastel porcelain. If you are interested in collecting this collection, please call Dehong for details.